Has the "War on Terror" destroyed the economy? The immense costs of the "War on Terror" has been presented as an argument against the fact-based conclusion, that 9/11 was a work from inside the USA. The question of such critiques is: "Why should the USA destabilize its own economy?" (Discussion in KPFA, "911´s footprint", time-index 36:45 and 51:25). This blog-entry will focus on reasons, why the "War on Terror" actual helps the economy and asks, who benefits from the attacks. The current way to transfer the monetary assets back into the economy is by borrowing to a creditor. This equality between monetary assets on the one hand side and debts on the other can be seen in this graphic, which reflects the development in Germany (source). In our current system, monetary wealth is connected with debt. The basis is, that money is a private good. Therefore money-owner can hold back money and blackmail interest from the creditors. The interest let the asset grow exponential (source) - ultimately there cannot be enough valid borrowers, who can work the interest out. The financial crises is based on this problem, that too little financial assets can flow back into the economy by creditors. 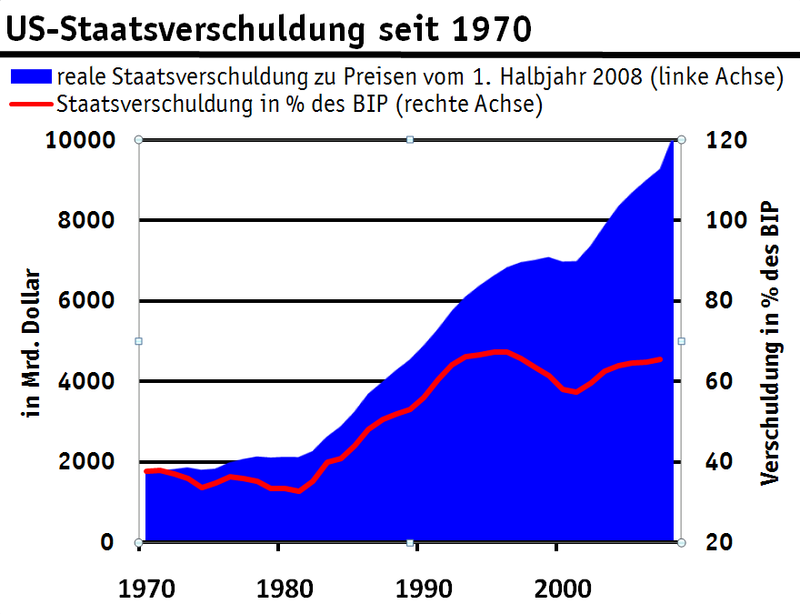 To overcome such a Deflation (source) there are different short term "solutions". For example can a war justify easily the public of an escalating borrowing by the state - as we can see in the "Cold War" or "War on Terror" (source). can someone translate this into basic English? andhowe on Wed, 09/14/2011 - 5:57pm. i found an interesting documentary, which explains the (true) background of the financial crisis. It can help you to understand my blog-entry better. bio on Tue, 11/29/2011 - 3:40am.